Please note there is limited parking due to another event in the park. Public transportation/car service is highly recommended. The May 14th concert is presented by Chillin Island, a collective of Queens born and bred musicians and artists that host a weekly program on Know-Wave radio. Chillin Island was founded by Ashok Kondabolu (aka Dap) and hosted with rappers Despot (Alec Reinstein) and Lakutis (Aleksey Weintraub). 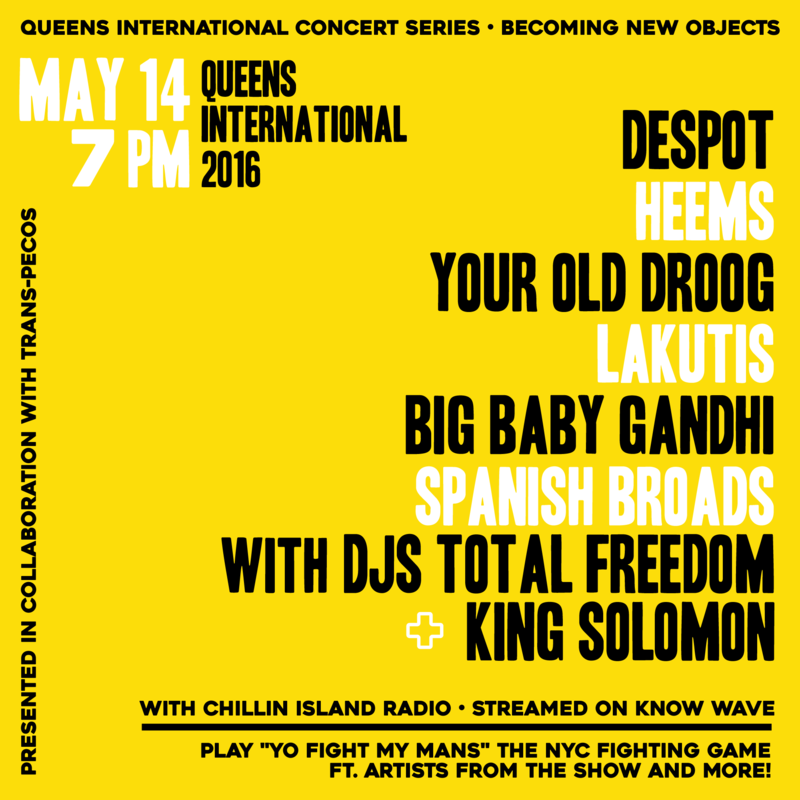 Queens rapper Heems (Himanshu Suri) headlines with Despot, the legend from 108th Street. Noise-rock supergroup Spanish Broads will reunite for the first time in six years, followed by a cohort of New York rappers: Flushing-bred Bangladeshi Big Baby Gandhi, Uptown’s own Lakutis, and Brooklyn’s Your Old Droog. Closing out the night is a DJ set from Total Freedom, with additional music provided by King Solomon. The night’s festivities will be streamed live on the Know-Wave radio network.